Life goes on because it must. Two little heads peer eagerly over the nest edge to view all the exciting things the Bassenthwaite Valley has to offer but in the best literary tradition there is a skeleton in the Family cupboard! Like all detectives we had considered a range of hypotheses before the event. Would it be eaten, ( cf the Springwatch bitterns) would it be thrown out (said to have been observed in other ospreys) or would it be buried within the nest? Whilst alive KL never gave up on her eldest chick even to its last movements; the evening before she was seen to offer it food even though it was too weak to lift its head or open its eyes. However, by the time we turned on the CCTV screens at 10.00am last Sunday morning both adults were completely ignoring the corpse. It was as if it had never been. A most telling sign was that although the parent birds still curled their talons in when walking near the live chicks, they had no compunction at walking on top of the dead one with toes and talons stretched wide. They made no attempt at deliberately burying the body but over the next couple of days nesting material, grass and leaves, which the birds constantly bring in anyway, gradually covered it up. – A rather disturbing thought to be sleeping on top of a family member, unless compared with the ancient Maya peoples who considered it bad luck let alone bad manners to bury one’s family anywhere but under the living room floor. Lake District Ospreys still a happy family. Thursday 26th June 2014 – Tea time! Need any more proof ? Sadly, but not surprisingly, we can confirm that our poorly chick died either Saturday night or early Sunday morning. 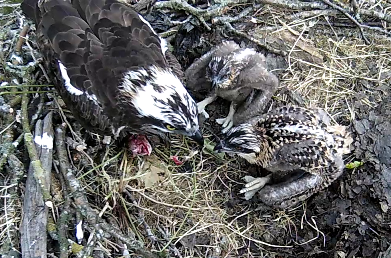 Although upsetting, we are also pleased its suffering is now over, and delighted that the remaining two chicks appear strong, healthy and are doing very well. Our superb nest camera at Whinlatter installed this year has given us tremendous joy and a tremendous insight into the private lives of our ospreys over the past weeks. 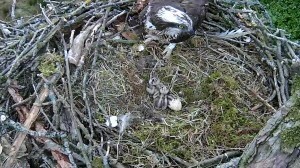 For the first time we watched an egg being laid and for the first time we had views of a hatched chick only minutes old. It is a privilege. It is also a privilege to see the darker side of the natural world. As with all creatures, including ourselves, sickness, accident and disability are a natural part of the cycle of living and dying. We deal with these things to a greater or lesser degree, but it is rare to see how other species cope. It is a week now since our eldest chick fell ill and became unable to move its right limbs. Our expectations were that either it would depart life quickly, within 24 hours, or get better. In the event neither of these happened as we made our predictions without taking the behaviour of its mother KL into account. A common attitude of birds would be to ignore or tip out a chick that displayed aberrant characteristics. However, KL has, to the best of her ability cared for her sick chick. Of course, the two healthy chicks must be her priority but. at night she has brooded it with the others, and she has fed it when it begged for food, moving herself into a position for it to reach her beak. Her main dilemma has been what to do when the sun shines (most of this week!) To prevent the chicks from getting de-hydrated or sunburned she stands on the nest edge casting her shadow over them. As the sun moves she moves and the healthy chicks scramble into the shade to keep cool. So for some of the time the sickly chick, has been left out– but periodically she has deliberately come and stood over it. Undoubtedly it is this care that has kept it alive, if not thriving, this long and we have had a unique opportunity to see how one wild family is coping with a difficult situation. On a much brighter note the other chick that looked ill has recovered and is eating and growing heartily! Sorry for the lack of updates over the last few days, but we have some worrying news from the nest. Over the weekend, initially one chick, then another became ill. We have taken advice from a vet, and it is suspected that two of the chicks are suffering from some kind of infection. We are very concerned, and will keep monitoring the chicks health and let you know how things progress. If there is anyone who deserves a medal it is Pete Barron, who has just been awarded the British Empire Medal. This is public recognition at a National level for outstanding commitment, making a difference and sheer hard graft at a Local level. His job is Management Ranger in the North for the Lake District National Park and as such he has been involved with projects too numerous to mention, from Himalayan Balsam eradication to combating erosion. Before that together with his family, he ran a youth hostel in Borrowdale, welcoming thousands of visitors to this beautiful area. He has been a member of the Mountain rescue team for 27 years, and is a very competent fell runner and skier. And for the Lake District Osprey Project he is a key figure. It was he who first noticed ospreys migrating North over Bassenthwaite Lake and in Partnership with the Forestry Commission and the RSPB devised the project, putting up nest platforms to encourage ospreys to jump from their stronghold in Scotland and breed again in England. Over the years he has guided and advised staff and volunteers, sharing his ornithological and human insights, and his unique spin on life makes him our favourite speaker. For visitors he is perhaps not so readily recognised but if you have watched any of our osprey Ringing videos on the screen at Whinlatter he features as the second pair of hands, face unseen, but holding the birds and assisting the Ringer and underpinning the whole process. Congratulations Pete that your dedication to underpinning one of the most beautiful and fragile areas of Britain has been honoured. The picture below was taken an hour or two after Three had pushed its way out of the shell. It had just got dry and started to recover a bit when unfortunately its squirmings took it on a U-turn and it ended up headfirst back in the shell again! There were a few minutes when we wondered whether it had a reverse gear or whether it would have to chip its way out all over again. But of course, it eventually escaped as its siblings and Mum moved around the nest and knocked the shell away. Happily, only a dead-end incident, not a dead-ending. Chick Two slipped into the world just as it was getting dusk on May 31st. The day time protection team stayed on to make sure it as not just a wobbly little ghost in the bottom of the nest. It followed quite quickly on its sibling’s heels – lay dates (April 23rd and April 26th) indicated it could hatch with up to three days difference but as we see in front of our eyes this does not always happen. 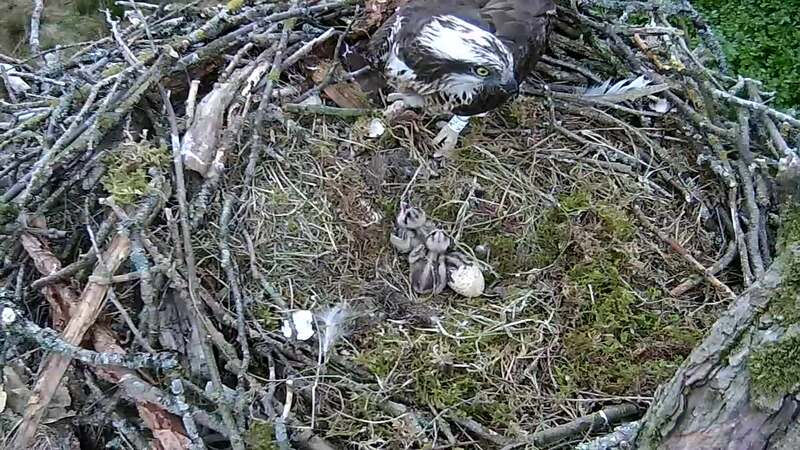 However, the third chick has read the hatching manual and decided to wait the three days (laid April 29th) and so has just hatched today at about 11.00 am, three days after the last one. Chick watching is a wonder with the new cameras. Newly hatched they have all been wet, floppy and a rather unattractive shade of pinky-violet. They lie exhausted after all that chipping, with ragged egg shells crunching around them. KL has removed some of the shells, left some and today, eaten some. However, over the next few hours the dank down strands dry off and the chick fluffs up like a tiny dandelion clock, with a repeating chime, calling out as its little stomach starts to feel the need for food. Interestingly, we saw One do a miniscule poop before it had been fed. 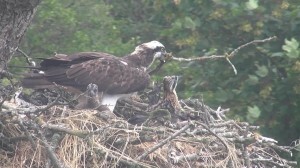 In true osprey style it up-ended, with its beak buried in the moss, and fired -in a full 3cm curve. Presumably the gut is full of a kind of meconium that is voided as peristalsis begins. Unring has been bringing in fish – the first were a headless perch and a river trout which KL carefully ripped into tiny pieces before feeding 2 or 3 mouthfuls to the squeaking chick. They will certainly have their work cut out with three to look after.